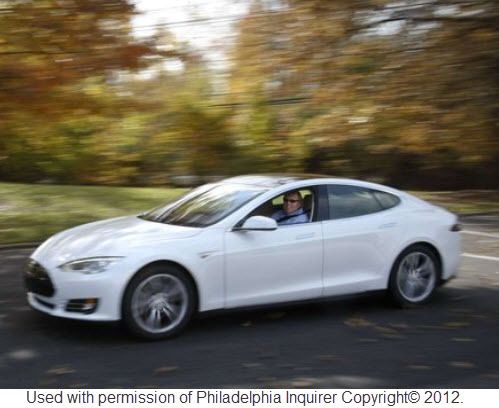 On December 4, 2012, Peter Spirgel, Managing Shareholder at Flaster/Greenberg PC, was featured on the front page of the Health & Science section of the Philadelphia Inquirer in the article “Electric vehicles’ popularity making inroads in U.S. and region.” Environmental reporter Sandy Bauers explains in the article how throughout the United States, and in the Greater Philadelphia region, electric vehicles are making inroads. Pictured above is Spirgel driving his Tesla Model S, an all-electric, zero tailpipe emissions vehicle, that he took delivery of in late November 2012. The Model S, which was named the 2013 Motor Trend Car of the Year, has the capability to travel 300 miles on a full charge and can go from 0 – 60 mph in 4.4 seconds. Bauers explains that Spirgel, who was the first to take delivery of the Tesla Model S in the region, is happy to play the role of early adopter. "Someone has to start this transition. And if people start driving these, the batteries will get better, they'll get a longer range, they'll get cheaper," said Spirgel. Frank Riesenburger, Chair of the Environmental Law Department at Flaster/Greenberg, was also quoted in the article. "This is absolutely the future of where automobiles are going to go," he said. "How long the infrastructure is going to take to build, we don't know. But it's here." Spirgel’s purchase of the Tesla Model S is one of the many green-energy initiatives the firm, and its employees, have taken to reduce their carbon footprint. In February 2012, Flaster/Greenberg was featured in the Courier-Post and on NBC10 for installing a level two electric car charging station in the firm’s Cherry Hill office parking lot. The charging station is a courtesy for clients who drive electric cars and an incentive for employees to buy environmentally friendly vehicles.